At the swishy Halcyon Gallery in London, tools of dreaded domestic chores become the source of unexpected nostalgic pleasure. Remember that old hand-mower your Dad made you cut the lawn with when you were a kid? Well, the bottom bit with the rotating blades, minus the handle, is affixed to the top of a large ornamental gate made from old industrial tools and iron scrap. And that meat grinder your grandmother used to turn the leftovers of the Sunday-night roast into ground beef? It is enjoying new life welded onto another gate that hangs against a white-washed brick wall. This extraordinary transformation of discarded tools is like walking into some working man's warped and magical imagination – Bob in Wonderland, if you will. And that Bob is Bob Dylan in the world debut of his ironwork sculpture, which opened last Saturday. Yes, that Bob Dylan. "Feel like my soul has turned into steel" the iconic singer-songwriter wrote in Not Dark Yet, a song about heartbreak and mortality on his 1997 album Time Out of Mind. 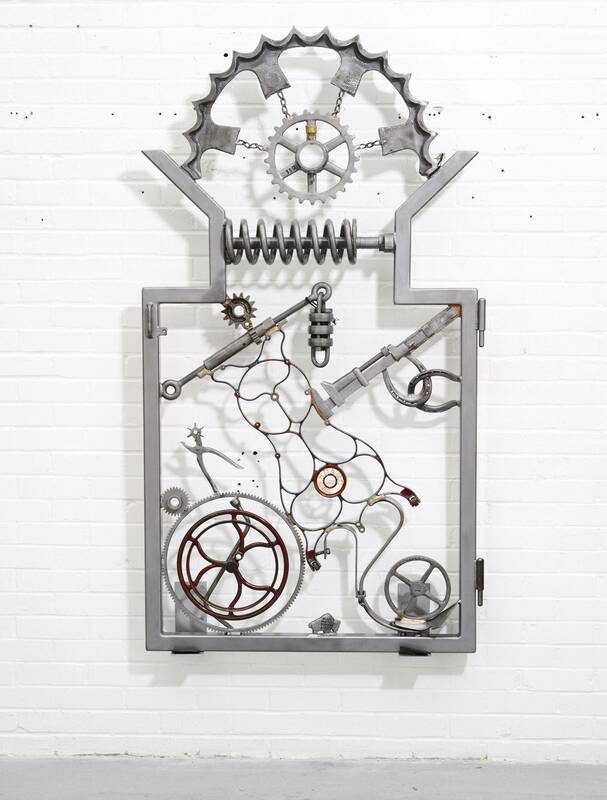 And here, in Mood Swings, an exhibition of seven gates and sculptural pieces that runs until the end of January, he is showing exactly that – his whimsy, his roots, his longing and reverence – in complex, welded entanglements of iron. It is not the first time Dylan, now 72 and still touring the world with his music, has displayed the wider scope of his artistry. In 2007, an exhibition called The Drawn Blank Series, a collection of 200 watercolours, gouaches and original drawings, based on sketches made while he was on the road, debuted in Germany to much acclaim. "Brush strokes are like his voice: straightforward, rough, occasionally fragile but always intent on illustrating the treads of human experience," gushed one reviewer in The New York Times. Yes, yes. Such effusiveness is understandable, really. Dylan is still making music – his 35th studio album, Tempest, was released last year – but when an American legend, especially one who is enigmatic and soulful, decides to show his art to the world, it is received like an oracle's mystical insights from behind the wall of his notorious privacy. The fact is, though, if his name weren't Dylan, his artwork might not get its praises sung so highly. His Drawn Blank work, some of which is on display at Halcyon Gallery, is not as Edward Hopper-ish as some people would like to think. Certainly, his series of 12 pastel drawings of composite fictitious portraits, Face Value, which is on display at the National Portrait Gallery in London, is entirely forgettable other than for the fact that you find yourself thinking: "Wow, Bob Dylan did this." But Mood Swings is something quite beautiful. "I've been around iron all my life ever since I was a kid," the native of Duluth, Minn., says in exhibition literature. (In keeping with his reclusive nature, he did not come to the gallery opening and was not made available for phone interviews.) "I was born and raised in iron ore country – where you could breathe it and smell it every day." There had been rumours he dabbled in ironwork. He told the Minnesota Times back in the late seventies that, when he returned to his home state, "I like to blast sculpture out of metal." But Dylan has long been mysterious. He has never revealed the identities of people and physical locales depicted in some of his songs. He is notoriously remote. Even onstage, some critics have written that he appears uninterested, as if he doesn't want to be there. Few took his comment seriously. It didn't help that in the same interview he also offered that he liked to roller blade, which seemed equally improbable. But five years ago, after being impressed with the Drawn Blank series even though he wasn't a Dylan fan, Paul Green, president of the Halcyon Gallery, visited the artist/musician in his studio in Los Angeles (he wouldn't divulge exactly where) and saw his metal work. "I didn't know he was sculpting things," Green says. "But he had been making these gates for himself and for friends." Green set about organizing an exhibition for the world premiere. It took Dylan three years to produce the ironwork for the Mood Swings show, which includes railings, a window grill, a folding screen and tables. 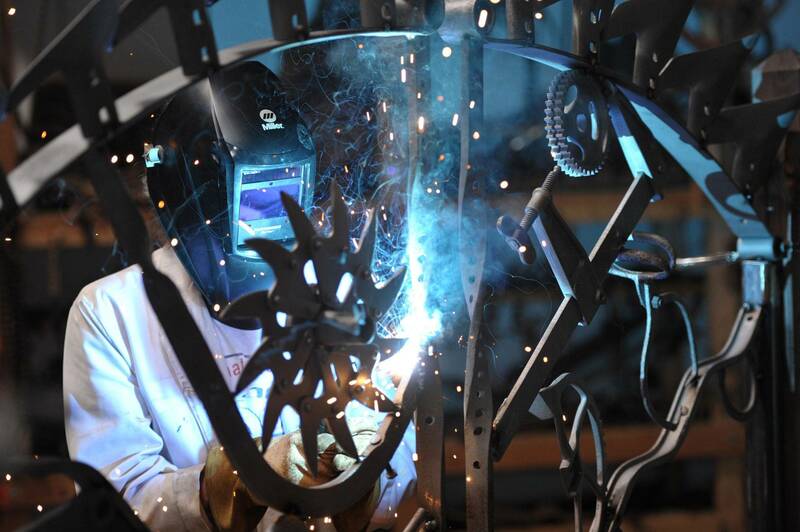 "He makes them himself, choosing elements, laying them out on the floor, and welding them. He is intimately involved," Green says. 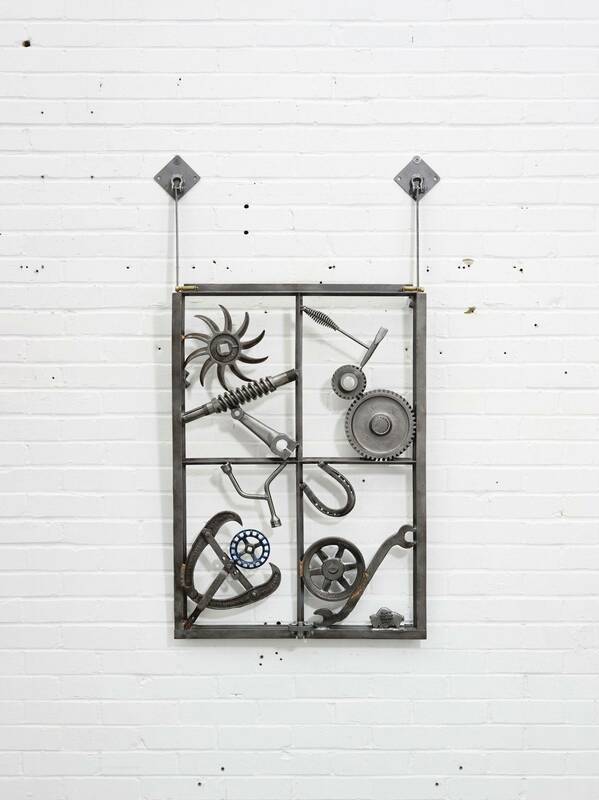 Each gate is a one-of-a-kind composition of vintage tools and metal objects Dylan collected from across America: horseshoes, calipers, anvils, pulleys, chains, shovels, wrenches, pumps, wheels, pliers and springs. The only pieces he made are flat metal objects such as a small guitar, a crow and the buffalo on each imprinted with the name Black Buffalo Ironworks, and Dylan's signature. 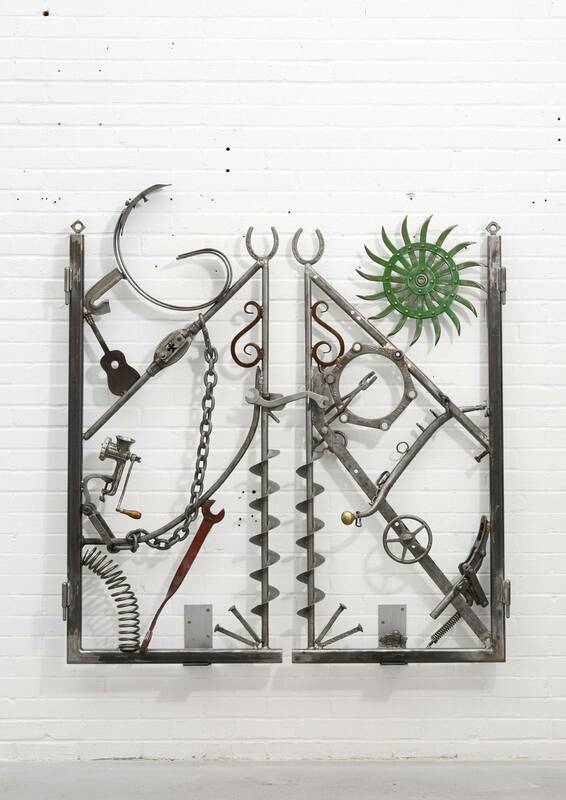 Quite apart from the delight of identifying the various tools in the mix, the gates provide an unexpected overall visual complexity that is both gritty and poetic; rough and graceful. 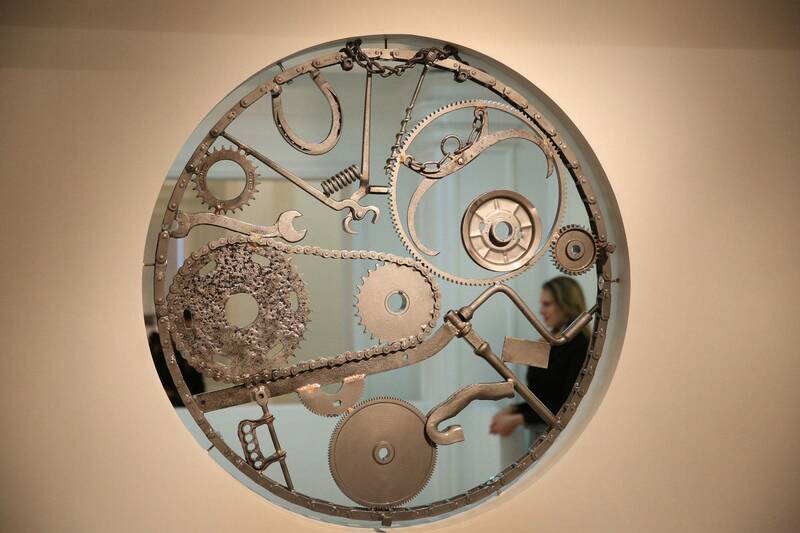 "Gates appeal to me because of the negative space they allow," Dylan has said. "They can be closed but at the same time they allow the seasons and breezes to enter and flow. They can shut you out or shut you in." True. 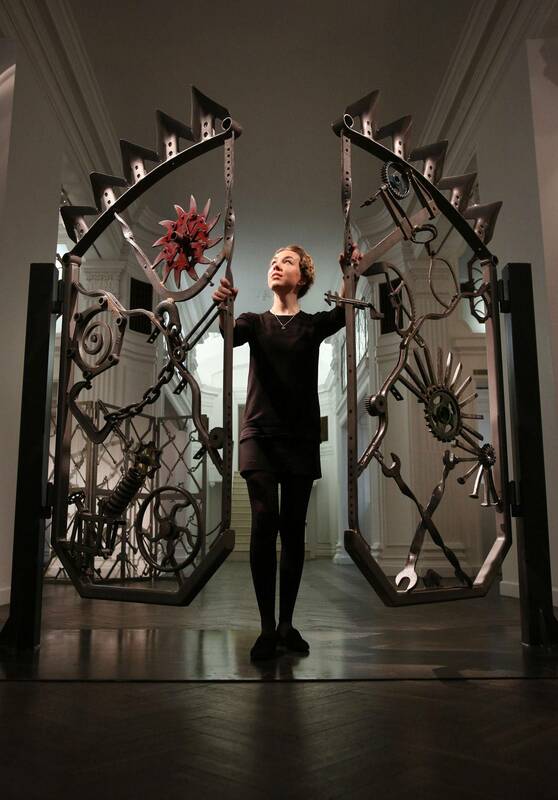 But in Dylan's hands, these gates simply draw you near, to touch, to inspect, to gaze at – and to drop your jaw at the price (about $500,000 for the largest ones, which are 171 centimetres high by 156 cms wide). Green told me they had all sold on the opening day. A celebration of the past, a longing perhaps for a time when things were done by hand, slowly, with reverence and by honest, hard-working people, the gates are clearly Dylanesque in their sympathies, rooted in American folklore and blue-collar ethics. But they are also indicative of the man himself, someone who has always been a welder of sorts. His music has fused together aspects of folk, blues, country and gospel. And in 2007, the award-winning film biography of Dylan, I'm Not There, by writer and director Todd Haynes, employed six distinct characters to represent the different aspects of Dylan's life. Only Dylan can make all his parts work harmoniously as one.